Cozy Chicks: HOW IS YOUR NOSE? Seriously, I’m not being rude. This is actually the customary greeting for the Ongee tribe of the Andaman Islands. For them, the universe and everything in it is defined by smell. I find this amusing. You might surmise I’m easily amused. You would be correct. But smells are important to me, too. For instance, a strong garlic odor is delightful if I’m in an Italian restaurant, not so delightful when I’m seated next to someone on a train. A heavy floral perfume will give me a headache in ten minutes. Same with cigarette smoke. Also some potpourri mixes. When you think of Thanksgiving, can’t you just smell the turkey roasting? The pumpkin pies baking? Christmas – the pine scent of the trees? When you think of summer, do you smell the freshly mown grass? For the cattle-raising Dassanetch of Ethiopia, no bouquet is more beautiful than a herd of cows. The men wash their hands in cattle urine and smear their bodies with manure to make themselves more attractive to the ladies. The Dogon of Mali rub fried onions all over their bodies. I think I’ve sat next to one of them on the train, too. Back in the seventeenth and eighteenth centuries, physicians like Hippocrates promoted the therapeutic use of scents, which we now call aromatherapy. Then in the early nineteenth century scientists tried to discredit the medicinal use of aromatics in favor of drugs. (Hint: It’s about the money.) And then the pharmaceutical companies sprang up in the 1950s, and they’ve been doing their best ever since to discredit EVERYTHING that isn’t made in one of their laboratories. Again, money. Fortunately, aromatherapy is now making a strong comeback. You’ll find a host of essential oils available at your local health food store, each one good for many uses. Just put a dab on your wrist or under your nose, or put some on a cotton ball and set it in a bowl in the room. Then breath. Ahh. All better. Depressed mood: Peppermint, chamomile, lavender, and jasmine. I know what you’re thinking. What the heck is ylang ylang? It’s the yellow-flowered tree native to the Malay peninsula and the Philippines from which this oil is obtained. I would add a few of my favorite scents to the mix. For relaxation, the smell of coffee brewing, or a cup of hot chocolate. To ease a cold, the smell of Vicks Vaporub. For a sense of coziness, any kind of cookie baking. What would you add to the list? Have you ever tried aromatherapy? I have to be careful as I am allergic to most perfumes. I have not foun d any problems with essential oils though. Smells trigger a lot of my happiest memories. I have a pretty strong sense of smell and allergies, so no prefumes for me. And certain flowers and soaps are too much for me too. Because I am so allergic to insect bites of any kind (some more than others) I use a few drops each of lemongrass and eucalyptus in a base of rose hips oil (you can also use alcohol but I also have a problem with that). I put a little on a tissue and keep it close, even wave it around if the bugs come near. Very effective insect repellent! And it smells wonderful. I've never used an essential oil, but I love the smell of lilacs. I started drinking peppermint tea recently and enjoying inhaling the scent before I drink it. Now I realize that the smell is a big part of my liking mint. They say our memory for scent is one of the most accurate of our senses. The smell of cigars can bring my father, who died in 1969, back to life for me. I have a collection of carefully collected good-quality essential oils, the type made from real ingredients instead of synthetic chemicals. They are hard to find, but so wonderful used in potpourris, etc. Bay laurel in one of my favorites, and instantly triggers Christmas memories. Smell memories are some of the best and worst I have! When I smell an apple pie I always think of my Gramma in her kitchen--same with bananas. The smell of Old Spice cologne sent me into a full-on panic attack at Walmart once, so yeah smells are powerful. My daughter is studying to be a massage therapist and aromatherapy is a part of that. She is always bringing home little cotton balls with different scents on them. It's amazing how similar we are in what we like and don't like. Eucalyptus is one of my favorites. We both love lavender and sandalwood. My nose is quite good, thank you! I know that some smells have a definite effect on me. Of course, memories are so well-tied to scents. My nieces had exceptional 'noses' when very young, especially the older one. They were like bloodhounds. They could tell who had been in a room and what chair they had sat in...and no, we didn't know stinky people! one could tell all sorts of things. I always ished she had gone into the perfume industry. At many writers' conferences, perfumes are banned because so many people have bad reactions. I have a casual friend who douses herself with so much scent that I can't stand to sit by her. Ugh. That's funny, Tonette. My daughter is like that. She sniffs food before she eats it, like a cat! My family has a particular fondness for scents with vanilla notes in them. Maybe it's in our DNA! Bay laurel. I'll have to seek it out and give it a try. Actually never heard of it before, Karen. Does it keep honey bees away? They're annoying the heck out of me right now, Leann. I grow mint in my garden and will add leaves to regular green tea to make it minty. Yum. Apparently, the smell of green apples is great for weight loss (don't ask where I read that!) I love the smell of fresh thyme and basil. Great post, Kate! My grandmother smelled of Chantilly, Chesterfields, and coffee. Chantilly can still take me back to the 50's, and hugs from my favorite relative. They say the scent of rosemary can help you remember, too. "Rosemary; that's for remembrance." Like many people, I have difficulty being near people wearing perfume - I avoid goingn any where near the perfume counter at stores. I can wear some scented lotions if they are not strong (although absolutely nothing with flowers or most herbs). I also cannot go into shops with incense or potpourri - even walking by open shop doors can give me a headache. But I love what I think of as "fall spices". Cinnamon and clove are my favorite scents, although I can also usually enjoy some vanillas, citrus and mints. But I do have trouble with many commercial products and oils. Not sure what they mix in, but it bothers me. I have the best luck with candles (Bath and Body works has a wonderful cinnamon/clove candle). I have a potpourri pot, and I mix ground cinnamon and clove with water. I use a cinnamon stick to stir it as it heats. It's a little messy but it makes the most amazing room freshener. People who walk into my house immediately comment on it. I've heard the same about peppermint. Maybe I'll give that a try. Those extra pounds from the cruise just won't budge! I need to buy some cinnamon sticks. I love those scents, too. Reminds me of cookies baking. 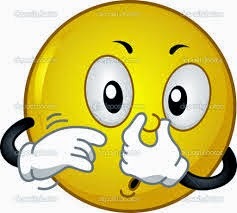 Have you always been sensitive to smell or did that come at a certain age? That's when it hit me, and many of my friends have said the same thing. Just wondering. That's my mother's name. Any time I read the spice in a recipe, I think of her. I've always been sensitive to scents, but it has become worse as I get older. Another one of those "joys" of aging.